Historically, distribution of the Learning Breakthrough Program™ has been heavily focussed on young people with varying degrees of learning difficulties or developmental challenges. This is in part due to the urgent need felt by parents of such young people to act forcefully to address such issues as well as the observation that such clients make the most dramatic gains with the program and in the shortest amount of time. 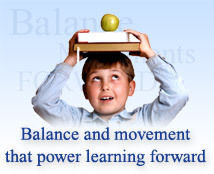 Additionally, the types of professionals who were, historically, most open to balance and sensory integration treatment approaches, namely occupational therapists, developmental optometrists, pediatric neurologists, pediatric psychologists and others were the most likely to have a client base made up of children and young adults with learning and developmental deficiencies. The Learning Breakthrough Program can be viewed as basic “brain fitness” or “brain calistenics”. It is very safe and appropriate for nearly anyone to use. That's right, nearly anyone. Teenagers, college students, adults, the elderly, stroke rehabilitation patients, physical therapy clients, traumatic brain injury patients, challenged students, gifted students, Autism spectrum clients, private school students, public school students, university researchers and all types of sports enthusiasts have used the program with great success and are counted among its most enthusiastic supporters. The range of benefits acheived with the progam is remarkable. From very serious cases of ADD/ADHD and Dyslexia to Central Auditory Processing Delay to traumatic brain injury rehabilitation to those with a range of ASD (Autism Spectrum Disorders) including Asperger's Syndrome and Pervasive Developmental Disorder to general balance and coordination issues that affect average students and adults all the time. It is also the case that cognitive abilities and academic and physical performance can be enhanced in people who are blessed to be without the types of diagnosed learning difficulties and neurological challenges outlined above. This is exactly why we describe the program generally as "brain fitness" and try not to stereotype it as being only for those in our population with "challenges". It is good for the mind and body of nearly everyone in the same way that physical exercise is good for nearly everyone that wants to keep their body functioning at an optimal level. If you would like to speak with a representative in more detail about specific uses and types of benefits that you might expect, please feel free to contact us.